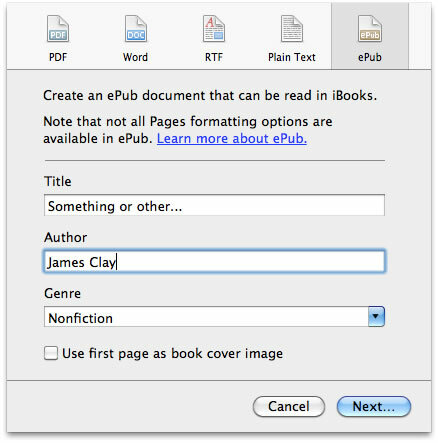 Apple have just updated their Pages word processing application to enable you to export your publication in ePub format. The ePub format is a standard e-book format that works within Apple’s iBooks apps on the iPad and the iPhone. It is also works on many other e-book readers, though not on Amazon’s Kindle! Apple have released some guidance and help on choosing between ePub and PDF. There are many different e-book formats which makes life challenging for anyone who wants to create e-books or resources in an e-book format for their learners. This entry was posted on Friday, August 27th, 2010 at 1:47 pm and is filed under apple, e-book, ebook, epub, pages. You can follow any responses to this entry through the RSS 2.0 feed. You can leave a response, or trackback from your own site. Good to know, I recently purchased an ipad…still searching for apps to install. I will keep this in mind. Sure you are aware of it, James, but some of your readers may not be: http://calibre-ebook.com/ is a great manager and converter of ebook formats. It’ll take a Pages-generated ePub file and easily make a Kindle friendly mobi file out of it. Thanks for the tip – although I found that you can’t have ‘floating’ images in ePub. Gah.